The ancients gave different names to all the 27 stars i.e. 27 zones of 13° 20′ commencing from Aswini and ending with Revathi. They are aware that the stars are not equally elongated from 0° to 13°-20′ and than another from 13"-20′ to 26°-40′ and so on. The Zodiac does not give the appearance of a circular wheel made of a cane with 27 rings in it. But the Zodiac is an imaginary pathway in the heavens. 360° in length and l5° in width with stars scattered all over, in and outside the Zodiac, and these appear as dots and not rods. The constellations selected by our sagas are either a group of stars or any single bright star, so that they can be first identified easily. A few of them are in the Zodiac itself but the majority of the groups are around the constellations which are named after these groups. These stars (constellations) may be very close to the 27 divisions of the Zodiac or far away, and they may be either to the North or to the South of the Zodiac. A few groups are very near and in the next constellation and yet they are chosen because they can be identified easily and they will be useful for reference and calculation to locate where a particular constellation would commence and end in the Heavens. Further, there is no other constellation within or near the zone which can be unmistakably identified. Therefore, these 27 stars are to guide us, so that we can calculate and ascertain the position of the 27 zones in the Zodiac, each measuring 13°-20. These 27 constellation are governed by the 9 planets. Hence, each planet rules over three zones at an interval of 120 (e.g.) Dragon’s tail. KETHU—Aswini, Makarn, Moolam. VENUS (Sukra)- Bharani, Pooram, Pooradam and so on. These zones modify the results of the planets transiting the Zodiac and not the stars, scattered in the Heavens which are far away. "Planets-are the immediate neighbors of our Mother Earth and these belong to one family. Probably this is the reason why they have selected only 27 groups of stars even though there are numberless stars in the sky which can influence the earth as much as these 27 groups. The two cycles, one of the changing Astrological Ages and the other of changing Ages based upon the shifting level of consciousness of humanity, overlap each other in unison like two wheels with different number of spokes revolving side by side with the same speed. 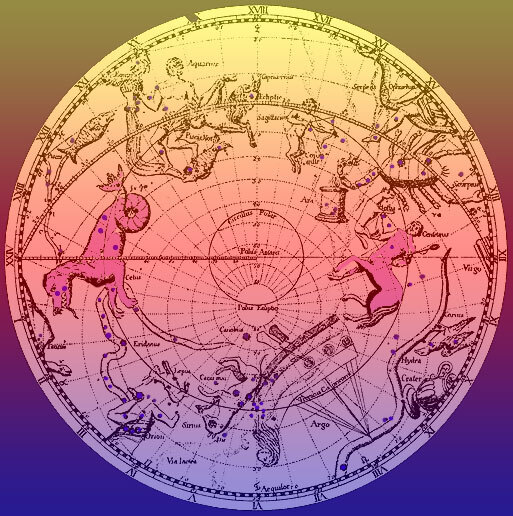 In vedic astrology, there are 27 constellations spanning the 12 signs of the zodiac. One of these constellations within the sign Gemini is Ardra, which is nothing but the second brightest star in Orion, known as Betelguese. It is supposed to be the abode of Shiva, one of the Trinity and the Vedic deity presiding over Destruction and Regeneration. Orion houses two constellations in Vedic astrology and is revered in all the Vedic texts as the gateway from where the souls descend to begin their earthly life. It is called the "Giver of Life". Astronomically, Orion is located in the gap between the astrological signs of Taurus and Gemini. This gap is one of the two celestial gateways in the Zodiac; the other one lies between the astrological signs of Scorpio and Sagittarius. Pleiades is again one of the constellations mentioned in Vedic astrology, and is supposed to be ruled by the Sun. It is revered as being the "Giver of transcendental Knowledge" along with understanding of the Cosmic Laws. I feel that all the Knowledge is out there already, and all we need to do is put the pieces together and synthesize all the seemingly unrelated aspects. The fact that Draconians among the constellations signifies the Flying Serpent, relates to the Mayan civilization which worshipped the Flying Serpent with the temples of Angkor, which were made in the image of this constellation. The Flying Serpent is revered in the Chinese culture as the "Dragon" which in turn symbolizes the very heights of wisdom and knowledge. The same Serpent is revered in the Vedic scriptures due its association with the "Kundalini" power, which resides at the base of the spine and is the giver of supreme enlightenment once it opens up the "Crown center" located at the top of the head. Vedic astrology represents this Serpent power through the Moons nodes, Rahu (north node) and Ketu (south node). All the cultures and civilizations past and present have a common origin. The science of astrology is the common link between the symbolism of all these cultures. Why it has become possible for us to break this astronomical / astrological code of the Ancients at the present time is because we might again be on the verge of another global transformation similar to that of 10,000 BC, and the key to our future may lie in this very Knowledge! This entry was posted on April 9, 2009 at 12:56 pm and is filed under Revelations. You can follow any responses to this entry through the RSS 2.0 feed. You can leave a response, or trackback from your own site. It’s out of whims that turn into a passionate quest perhaps! I am interested in Astrophysics & the likes that cover related articles. I would enlist some sources where you could get more on such topics. Perhaps you can contact me directly at my email id.